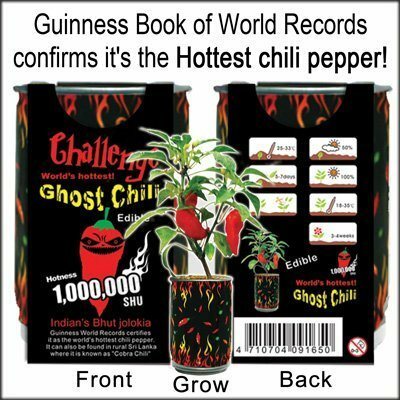 Topping the scales with some extreme heat, this pepper plant features flame throwing, mouth scorching, building burning, heat. Similar to the Naga Viper plant which is a combination hi-bred of three of the worlds hottest peppers bhut jolokia, naga morich and Trinidad scorpion, this red pepper from India will blaze a trail with 1,001,304 Scoville units which is a measure of heat. Put this in perspective, the jalapeño pepper only has 2500 Scoville units of heat while regular Cayenne has 30,000. Are you man enough to try this? 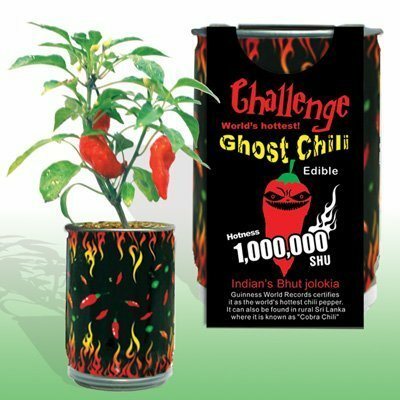 There is a reason why the Bhut Jolokia is called ghost pepper. You will think you are dead after eating this bad boy. This magic plant contains preplanted seeds in a unique mineral rich substrate so anyone should be a will to grow this. Take off the see-through plastic cap on underside of can and follow the simple included instructions. Be sure to pop the drainage tab on underside of the ghost chili pepper can. Open and remove the tab and lid on top of can. Add water until excess water drains from bottom.